Boogie's really getting into the World Cup, and thinks he would make an excellent goalie. U.S.A.! U.S.A.! U.S.A.! THANK YOU for giving me a good laugh. I just love me some Boogie in the morning. Hey, did you know it's take your dog to work day? Oh wait, isn't that almost every day for you? Why do I suspect Boogie is piqued he can't get his mouth around it, which means it's not a real ball, just a round thing he can chase, just like an overweight cat with fewer legs? Speaking of the World Cup, one of my many British expat buddies (Jersey City is chock full of them) came up with a great line for the group stage: "This world cup has been like the Second World War: France and Italy are knocked out early, and the Americans show up late, leaving England to fight Germany." Eric, that ball has ropes attached to a harness around the ball. 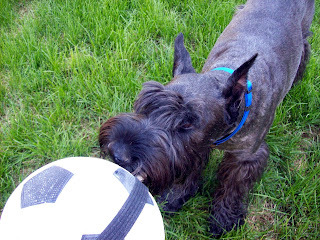 So from Boogie's perspective, it's really more of a tug-of-war toy than a soccer ball. Which, from his point of view, makes it better than a ball, because he's kind of lukewarm about balls (unless they're new), but LOVES a good tug-of-war. AWESOME! Tug'n'growl, Boogie! Good dog! LOVE Vagabond's take on the world cup. But how about the endless tennis match played at Wimbledon? I just end up buying my dog cat toy balls. Once a week I have to check under all the couches/chairs for all the balls that have gone MIA. Hahah otherwise he would become "DestructoDog." As opposed to "Demento Dog," our occasional houseguest and the weirdest looking dog on the planet.